Oil mogul and business tycoon Femi Otedola had only nice words for Aliko Dangote as the billionaire industrialist turned 62 on Wednesday. Happy birthday to the greatest man that has come out of Africa. My brother, the Visionary, owner of the 2nd largest sugar refinery in the world, the largest cement factory in the world, one of the largest flour mills in the world, the 2nd largest fertiliser plant in the world that is due for completion, and the biggest oil refinery in the world. 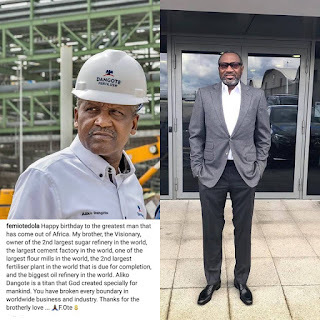 Aliko Dangote is a titan that God created specially for mankind. You have broken every boundary in worldwide business and industry. Thanks for the brotherly love. Indeed, beyond words and praises Alhaji Aliko Dangote has indeed broken boundaries.